Vi läser under hösten några stycken ur den sydamerikanske munken Ernesto Cardenals bok Kärleken övergår allt – korta stycken med mycket innehåll, där de flesta kan känna igen något. 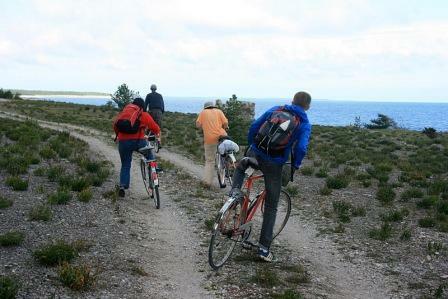 I August a few of us went to the island of Gotland, the big island in the middle of the Baltic. The Dominican brothers ha ve a little house on the countryside, a simple place with not much commodities. A place to spend time alone, or to make simple retreats. Perhabs we can call it that, what we did during five days in August– prayers in the morning and evening, then some workshop exercices. Afternoon we biked to the sea, went swimming and relaxed. Every day we read a part of Jesus Today, a book that perhabs will appear on our Monday evenings later this autumn. We also had nice meals together and sat talking in the evenings. Here´s our tales from those days. “Do you have expectations for this week?” was the question asked when driving to Gotland on that nice August evening. Difficult to say. One always carries pictures gathered from former experiences to fill the void of what is still unknown, until meeting with the new reality makes them vanish. So I was probably expecting on Gotland something similar to my previous “island” experiences. But those five days evoked more the generous quietness of summer holidays at my grandmother´s than the visceral meeting with the wild forces of nature. Maybe it is what remains now of this stay – the growing awareness that those both poles exist within me, too. And in my inner ocean a new island offers henceforth its harbour to the perpetually migrating bird. One thing I would like to recall from the retreat. 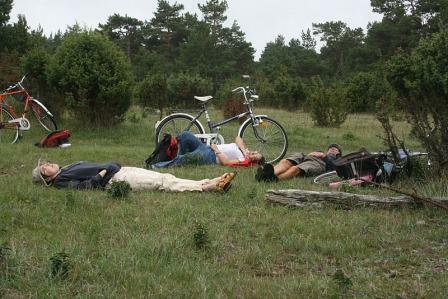 In the middle of August, five people met together in order to ‘retreat’ away from their everyday life, to rest, to discover beauties of the island Gotland, to get to know each other, and to get closer to the Highest. I was one of them. Five people, different ages, different personalities, some students, some researchers, some already working, people at different stages of their lives, people at different stages of their ‘spiritual journey’. Can this work? This were my thoughts when we were sitting in a car on Tuesday afternoon on the way from Lund to Oskarshamn where we took the ferry to Visby, a capital of Gotland, and then to the far north of Gotland. …and suddenly it is time to go back. Everybody carrying her/his own piece of clay in the backpack, continuing the ‘life before’. Or is it a different life, the life after? Gotland was a more unusual name. The landscape changed, and the desire grew. But to each one the Free Radical Jesus spoke to heart. A violent sky . At the horizon dark clouds, closer there are some dramatic clouds and the blue sky. There is a wind and the sea looks dangerous. And beautiful! And there is Nolwenn swimming, and Taras and Milan further out. Karen is a little dot at the shore, looking down- for precious stones? Interesting. A totality of passing moments, new angles, surprising expressions and crazy jokes. Life is crazy I guess. A crazy prayer! Thrown out in the windy sea, rain approaching. An astonishing view and some people together –swimming. TORSDAG 24 november okt 17.15-18.30: –Ung? Katolik? I Sverige ? Vi har träffats några gånger på upptäcktsfärd efter hur det är att vara ung och katolik i Sverige – och framför allt: vad är centrum i vår tro. Det har tagit oss hit – att titta på oss själva och riterna och vårt möte med Gud. Även den som inte varit med tidigare kan komma. Den här gången: Vad händer egentligen när brö´d och vin blir Jesu kropp och vin? Om symboler, våra handlingar och Gud, den osynlige, som blir synlig.